City Attorney’s Office group photo, January 2016. 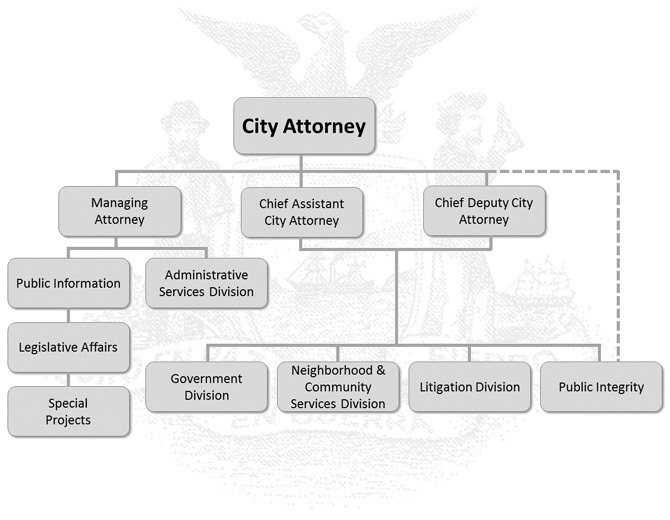 The mission of the San Francisco City Attorney’s Office is to provide the highest quality legal services to the Mayor, Board of Supervisors, and other elected officials as well as to the approximately 100 departments, boards, commissions and offices that comprise the City and County of San Francisco’s government. The City Attorney is also authorized under state law (Bus. & Prof. Code §§ 17200 et seq.) to pursue allegations of unfair and unlawful competition civilly. In these cases, which usually involve consumer and tenant protection matters, the City Attorney represents the People of the State of California. Organizationally, the office is divided into four general areas: (1) litigation, claims and investigations; (2) government; (3) neighborhoods and community services; and (4) administration. The litigation, claims and investigations teams handle all civil claims and lawsuits filed against the City and County of San Francisco. Litigators sometimes also pursue civil actions in which the city is a plaintiff. Trial attorneys, investigators and legal support professionals handle many cases in addition to defense work, on matters as varied as code enforcement; public integrity cases against public officials, lobbyists and contractors; unfair competition actions against corporate defendants; and many others. The claims and investigation units manage and investigate claims filed against the city. Claims are usually a required first-step before most kinds of lawsuits can be filed against government entities under California law. The claims section of this website more fully explains how to file a claim and how the claims process works. Together, these City Attorney employees represent San Francisco in approximately 7,500 actions annually—ranging from personal injury and property damage to child custody, welfare fraud, breach of contract, workers’ compensation, and more. Government division attorneys work with client policymakers and departments to draft and approve “as to form” all municipal ordinances and city contracts. With the capable assistance of legal support professionals, this team’s attorneys also provide advice on an array of legal issues requiring expertise in public finance, transportation, land use, environmental regulation, real estate, contracts, construction, labor, public utilities (water, power, sewer), rate setting, aviation and maritime law. Litigators also work with paralegals and other legal support staff on appellate advocacy and defending local laws when the validity or application of those laws is challenged. The neighborhood and community services division includes teams that investigate and pursue violations of city building, fire, health and safety codes; represent local government’s child and family services responsibilities; and provide legal counsel to San Francisco’s health, education, social services and public protection functions. (These departments together account for the largest share of the city and county budget). The administration division has responsibility for overall service delivery and resource allocation to our numerous clients, including the Mayor, Board of Supervisors and over 90 departments, board, commissions, and offices of the City and County of San Francisco on all civil law matters. The team is responsible for all office operations, including finance, public policy, human resources, information technology and communications. The division also oversees external relations and strategic alliances with law school programs, other public law offices and legal services organizations.